We offer KMC chains for you, in line with our philosophy of supplying only the finest products. A typical bike chain consists of roughly 650 individual parts, one of the most important, crucial parts of your bike. When it functions well, you are not aware of its existence, but when there is something wrong, you will notice the extra effort needed when riding, a loss of performance, and the noise. There two things to consider; the pitch of a chain, and the width of the chain. The pitch is in 99% of cases is 1/2 inch, meaning the distance from chain rivet pin to chain rivet pin is nominally half an inch. The sprocket teeth on your bike are made to this standard too. The width of chains does vary depending on the number of gears a bike has and the unique features some manufacturers add to their gear systems. 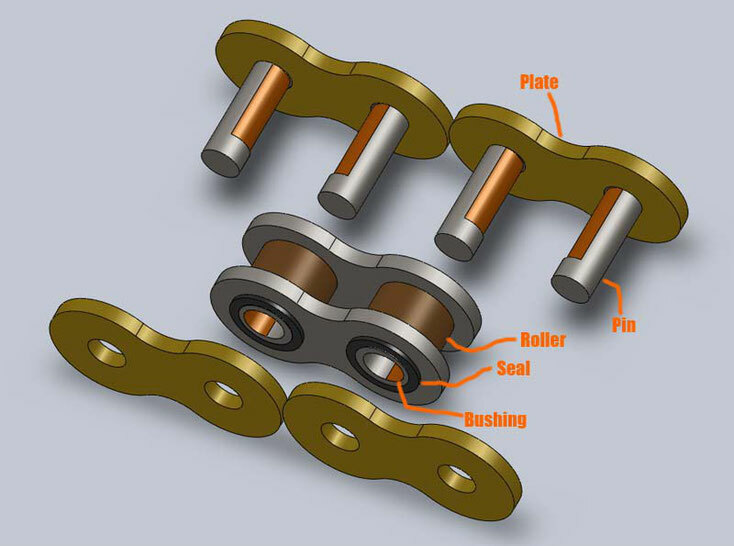 Single speed chain is designed for bikes with one sprocket on the crankset and one sprocket on the wheel. The width of the roller is nominally 1/8" wide (3.3mm). The single speed chain will measure approximately 9mm wide across the rivet. There are rear hubs with internal gears such as the very common Sturmey Archer three speed hub, these normally use the 1/8" chain. Some but not all fixed wheel bikes (Fixie bike) will use this size of chain. Single speed 1/8" wide chains are not designed for the multiple rear cog gears found on bikes with derailleur gear systems. Derailleur gear systems may have up to three front chainrings and varying number of rear cog sets with 5, 6, 7, 8, 9, 10, 11, or even 12 sprockets. As the number of cogs on the rear hub increases, the spacing between cogs tends to be reduced. With derailleur equipped bicycles, the external width of the chain matters, because chains must not be too wide for the cogset or they will rub on the next larger sprocket, or too narrow that they might fall between two sprockets. Chains tend to get narrower as the number of rear cogs increases. For road use, inspect your chain at least once every month or every 250 kilometres (150 miles). For off road use, inspect your chain at least once every 100 kilometres (60 miles). Clean your chain after every ride if possible, especially after riding in the wet. Use a piece of dry clean cloth to clean the chain. Do not forget the sprockets, front changer and derailleur pulleys. To remove mud or sand, use the bristle brush (an old toothbrush is ideal), use slightly soapy warm water. Do not use acidic or alkali based detergents (such as rust cleaners) these can damage the chain. Do not dip your chain in solvent degreasers - they will remove the grease from the chain’s bearings. If the chain is really dirty and difficult to clean, besides using a brush for the inside, try putting some solvent on a cloth and use it to clean the chain’s exterior. Try to avoid a ‘chain washing machine’ in combination with solvent. This will instantly ruin your chain washing out lubricants in the chain. Some lubricant brands advise you to completely degrease the chain, KMC does not recommend this. Lubricate the chain whenever necessary and after you clean it. Before lubricating, make sure the chain is dry. Use a lubricant which initially penetrates the chain’s bearing. In this way you can reach the chain parts which are most sensitive to wear. Make sure you are using the appropriate lubricant - if using an aerosol you should test it by spraying some on your hand - first it feels like water (penetration), after some time it should become sticky or dry (durable lubrication), KMC recommends it’s Chain Lube Original. In order to avoid a build-up of excess grease, apply it to the critical places only, like the rollers. This helps to reduce chain wear and noise. Apply just a little grease on the rest of the chain to prevent rust. Remove excess grease from the outside of the chain by using a cloth, this prevents a build-up of dirt and dust. Prepare for wet and muddy, or dry and dusty conditions, by applying some wax after lubricating the chain. In the case of derailleur bikes, use the same principle as above for maintaining and lubricating the derailleur pulleys, chainrings and cassette sprockets. Before re-connecting your chain, clean the chain ends inner bearings to make sure no dirt remains, then apply some grease inside and on the connector’s pins and connect the chain up ready for testing. Finally test the chain by running and shifting up and down the the gears, make sure all gears function smoothly.